Most religious movements and political dynasties throughout history have had one city that could be called the focal point, or heart, of the movement – Rome, Jerusalem, Constantinople and so forth. For the Nazis, the heart of their movement was the magnificent medieval city of Nuremberg, symbolizing the link between Germany's Gothic past and its Nazi future. Each September, a pilgrimage was held in which followers gathered from all over the Reich to participate in torchlight marches and solemn ceremonies honoring fallen Nazis. There were also big military-style parades, and most important of all, a chance to see the Führer in person. In September 1934, American journalist William L. Shirer had just arrived in Germany to work as a reporter for the Hearst Company. He proceeded to keep a diary of the entire seven years he spent reporting from inside Hitler's Reich. Shirer thought it would be a good idea to attend the 1934 Nuremberg Rally to better understand the Nazi phenomenon. On his very first evening in the old city, he found himself accidentally stuck among a throng of ten thousand people in front of Hitler's hotel, shouting: "We want our Führer!" Leni Riefenstahl chats with Heinrich Himmler during filing at Nuremberg in September 1934. 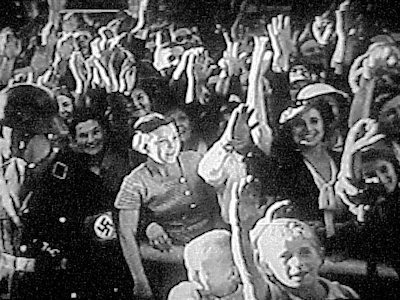 Below: A scene from her finished "Triumph of the Will" shows women greeting Hitler upon his arrival in Nuremberg. 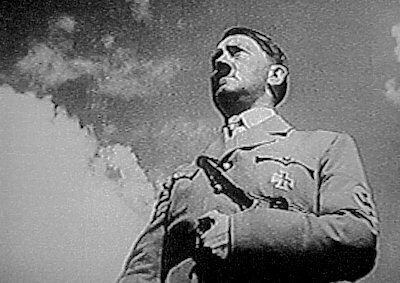 Below: A clever camera angle used by Riefenstahl in her film makes Hitler appear larger than life on the movie screen. Below: One of the most enduring propaganda images of the Third Reich - the omnipotent Führer (with Himmler and Lutze) in front of 160,000 Germans arraigned in perfect geometrical formation. 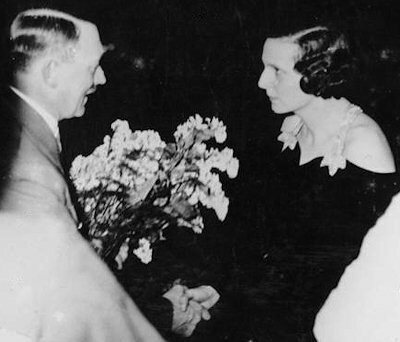 Below: Hitler with Riefenstahl in 1934. She remained a darling of the Third Reich for the duration - and went on to make a second notable film about the Berlin Olympics in 1936. "I was a little shocked at the faces," Shirer wrote in his diary, "when Hitler finally appeared on the balcony for a moment. They reminded me of the crazed expressions I once saw in the back country of Louisiana on the faces of some Holy Rollers...they looked up at him as if he were a Messiah, their faces transformed into something positively inhuman." The next morning, Shirer was among the attendees at the Rally's opening ceremony, held inside a large hall on the outskirts of Nuremberg. It was Shirer's first experience with Nazi pomp and pageantry. "I am beginning to comprehend," he wrote, "some of the reasons for Hitler's astounding success. Borrowing a chapter from the Roman [Catholic] church, he is restoring pageantry and color and mysticism to the drab lives of 20th Century Germans. This morning's opening meeting...was more than a gorgeous show; it also had something of the mysticism and religious fervor of an Easter or Christmas Mass in a great Gothic cathedral. The hall was a sea of brightly colored flags. Even Hitler's arrival was made dramatic. The band stopped playing. There was a hush over the thirty thousand people packed in the hall. Then the band struck up the Badenweiler March...Hitler appeared in the back of the auditorium and followed by his aides, Göring, Goebbels, Hess, Himmler and the others, he slowly strode down the long center aisle while thirty thousand hands were raised in salute." To Shirer, the intoxicating atmosphere inside the hall was such that "every word dropped by Hitler seemed like an inspired word from on high. Man's – or at least the German's – critical faculty is swept away at such moments, and every lie pronounced is accepted as high truth itself." It was during this opening meeting that Hitler's victorious proclamation was read: "The German form of life is definitely determined for the next thousand years." 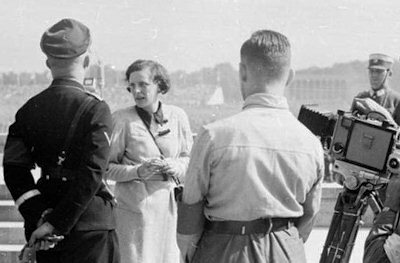 At Hitler's personal request, a 31-year-old actress and movie director named Leni Riefenstahl was filming the entire week-long Rally. Utilizing thirty film cameras and 120 technicians, she produced an extraordinary film record of the festivities, featuring many unique camera angles and dramatic lighting effects. 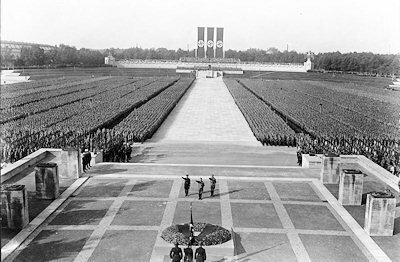 Riefenstahl's finished masterpiece, Triumph of the Will, contains many impressive scenes, but perhaps none more powerful than the scene in which Hitler, Himmler, and the new SA leader, Viktor Lutze, walk down a wide aisle in the center of Nuremberg stadium flanked on either side by gigantic formations of Nazis in perfectly aligned columns. In previous years, the three men walking that path would have been Hitler, Himmler and Röhm. But the troublesome Röhm was now dead, replaced by the dutiful and lackluster Lutze. Back in February, it had been Lutze who told Hitler about Röhm's comments concerning "that ridiculous corporal." For his steadfast loyalty, Lutze was given command of the SA with strict orders from Hitler to keep the Brownshirts firmly in line. On Sunday, September 9th, during the Rally, Hitler faced a mass gathering of his SA Brownshirts for the first time since the Night of the Long Knives. In scenes well-documented by Riefenstahl's cameras, about 50,000 Brownshirts stood in neat formations and listened to a slightly edgy Hitler attempt to patch things up. Interestingly, the film also shows a huge cordon of SS guards in attendance. "Men of the SA and SS," Hitler bellowed from the podium, "a few months ago a black shadow spread over the movement. Neither the SA, nor any other institution of the Party, has anything to do with this shadow. They are all deceived who believe that even one crack has occurred in the structure of our united movement...Only a lunatic or deliberate liar could think that I, or anybody, would ever intend to dissolve what we ourselves have built up over many long years...In the past you have proved your loyalty to me a thousandfold, and it cannot and will not be different in the future." Thus Hitler absolved the SA membership from any complicity in the events precipitating the blood purge. And amid a hearty chorus of 'Sieg Heils,' the Brownshirts sounded their approval. Any concerns over possible trouble from the SA during the Rally had been unfounded. Riefenstahl's film next shows a lengthy sequence featuring the grand finale parade, and concludes with Hitler's speech at the closing ceremony in which he labels the Rally "a most impressive display of political power." Hitler goes on to declare the Nazi Party "will be unchangeable in its doctrine, hard as steel in its organization, supple and adaptable in its tactics. In its entity, however, it will be like a religious order..."
For many Germans, a trip to the Nuremberg Rally was indeed a religious-like experience and they returned home with renewed dedication to the Nazi cause and increased devotion to their Führer. Upon the very first screening of Triumph of the Will in 1936 the Nazis knew they had struck propaganda gold. The film played to packed movie theaters throughout Germany. For her efforts, Riefenstahl received a Cultural Achievement award from Goebbels' Propaganda Ministry. The film also won a gold medal for its artistry at the 1937 World Exhibition in Paris. The legacy of Triumph of the Will lives on today in the numerous TV documentaries concerning the Nazi era which replay portions of the film in regard to Hitler's early days, or show snippets of euphoric Hitler Youth, or the SS goose-stepping smartly on parade. The film's most enduring and dangerous illusion is that Nazi Germany was a super-organized state that, although evil in nature, was impressive nonetheless. In reality, Nazi Germany was only well organized to the degree that it was a murderous police state. The actual Reich government was a tangled mess of inefficient agencies and overlapping bureaucracies led by ruthless men who had little, if any, professional administrative abilities. From the Reich's first hours in January 1933 until the end in May 1945, various departmental leaders battled each other for power, and would do anything to curry favor with a superior Nazi authority and especially with Hitler, the ultimate authority. Hence, they would all become enthusiastic cogs in the Führer's war and extermination machines. In 1934, over a million Germans had participated in the hugely successful Nuremberg Rally. And from this point onward, the rallies got even bigger. The following year, 1935, is remembered for the special announcements concerning the status of Jews in Germany. These new rules became known as the Nuremberg Laws and for the Jews of Europe would one day be a matter of life and death.